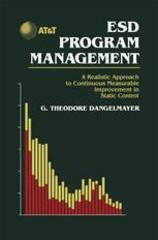 Dangelmayer, ESD Program Management, 2nd ed. ESD Program Management, 2nd ed. This is a revision of the highly successful electronic manufacturing guide, ESD Program Management: A Realistic Approach to Continuous Measurable Improvement in Static Control. This revision is comprehensive and explains how to develop, implement and manage an ESD control program, and includes up-to-date data, many new chapters, new case studies, and much more. Extensive changes and additions to auditing techniques, cost benefits data, and materials evaluation. New case studies on field-induced failures in the factory, long-distance central office system upsets, and automation-caused failures. The author has also included the latest information on handling procedures and requirements from the Lucent ESD Control Handbook. ESD Program Management: A Realistic Approach to Continuous Measurable Improvement in Static Control, Second Edition, is a refreshingly unbiased guide for electronic manufacturing and quality control professionals. 1. Twelve Critical Factors in ESD Program Management. 3. Implementing an ESD Control Program: The Basic Steps. 5. Economic Benefits: Seven Convincing Case Studies. 6. Designed-In Protection and Product Testing. 9. Common Problems in Smaller Companies. 10. Guidelines for Smaller Companies: An Innovative System Audit. 12. Using Auditing Results to Manage the ESD Program. 13. Statistical Process Control and ISO-9000. 14. Material Characterization and Auditing Measurements. 15. Purchasing Guidelines: Finding the Hidden Costs and Problems. 16. Training for Measurable Goods. 20. Strategic and Economic Benefits. Appendix 1. Lucent Technologies ESD Policy. Appendix 2. Industry, Military, and Lucent Technologies Standards Used to Evaluate ESD Control Materials, Equipment, and Devices. Appendix 3. How to Test the Integrity of the Ground Connection on a Work Surface. Appendix 4. Installation and Maintenance Costs of Carpet.